The majestic vistas of the Canadian Rockies combined with an unforgettable Alaskan cruise up the Inside Passage on a captivating 17 day coach and cruising tour. The relaxed lifestyle of the Alberta ranchlands give way to the national parks of the Rocky Mountains, teeming with wildlife amidst spectacular and unique geography. The mountains of Whistler and the Coastal range are the gateway to the historic streets of Vancouver. Boarding a comfortable, full service Holland America Cruise, sail north through the dramatic scenery of the Pacific Northwest coastline. With ports of call at Ketchikan and Juneau, this cruise provides a true sampling of the wonders of Alaska. Arrive at Calgary International Airport by non-stop flight from the U.K. Transfer individually to your centrally-located hotel or we can arrange a transfer for you in advance. If you would prefer to arrive a day or two earlier, we can arrange pre-tour accommodation for you at the hotel. Your tour director will contact you in the late afternoon to give details on joining the tour. Explore the Old West at the Glenbow Museum or Fort Calgary on your own, browse through the Eau Claire Market, ride up the Calgary Tower for a great view and savour the great restaurants and dynamic nightlife. We begin the day with a city tour of Calgary. Leaving the city, we travel west on the Trans-Canada Highway into the rolling foothills of the Rocky Mountains. The majestic peaks of the Canadian Rockies soon fill the horizon as we approach Banff National Park, our first of several in the Canadian national parks system. We soon arrive in the charming resort town of Banff. Today we will enjoy a tour of the region around Banff. The area became Canada’s first national park in 1885 to protect its natural hot springs. An optional Helicopter Sightseeing Tour will give you the chance to see the eastern ranges of the Rocky Mountains. Alternatively, you can take an optional gondola ride to spectacular Sulphur Mountain. Bring your camera! The rest of the day is at leisure to explore the surroundings of Banff, stroll along Banff Avenue, or relax and enjoy the scenery. Today’s journey through Banff and Jasper national parks promises to be a highlight of our Rockies Trail programme. Shortly after leaving Banff we visit the famous scenery of Lake Louise, one of the most photographed lakes in Canada. Afterwards, we travel north on the famed Icefields Parkway through a rugged wilderness flanked by dramatic mountain ranges. At the Columbia Icefield we board a specially constructed Ice Explorer to ride on the surface of the ancient Athabasca Glacier. Close to Jasper, you have the chance to go on an optional raft trip on the Athabasca River. Your experienced guide will point out the natural and human history as you raft through short rapids and stretches of calm waters. Overnight in Jasper. Before leaving Jasper National Park this morning, you can take part in an optional Spirit Island Cruise on Maligne Lake, the most picturesque and largest glacier-fed lake in the park. You may alternately take an optional motorcycle tour of Jasper, riding in the comfortable sidecar with an unmatched view of the forests and mountains. Then, we travel west along the Yellowhead Highway and into the heartland of British Columbia. Breathtaking, unspoiled vistas await visitors in every season of the year. The route takes us along the Thompson River through the picturesque Shuswap Highlands. Overnight in Kamloops. We can expect a day of dramatic scenery changes when we drive through the ranch lands and head for the coastal mountains. A journey along the Duffey Lake Road exposes new vistas at every turn. An optional Floatplane Sightseeing Tour over Garibaldi Park gives you an inspiring view of a natural preserve of volcanic peaks, alpine lakes and meadows. Enjoy the rest of the day at leisure. The Sea-to-Sky Highway leads us south through spectacular coastal scenery today. From Horseshoe Bay, we cruise by ferry across the Strait of Georgia to Vancouver Island and continue by coach to Victoria, British Columbia’s capital city. Arriving in Victoria, we embark on a city tour of this former British enclave. Proud of her maritime heritage, Victoria has retained a quaint, colonial demeanour evident in the many 19th century landmarks throughout the city. Today we treat ourselves to a tour of the world famous Butchart Gardens, one of the world’s great floral displays set in a reclaimed stone quarry. Time will be allocated here for browsing through the regal gardens. You can take part in an optional Floatplane Sightseeing Tour over downtown Victoria and the Strait of Juan de Fuca with the Olympic Mountains in the distance. You can also go on an optional Whalewatching Excursion aboard a Zodiac or a regular vessel. Watch for the magnificent orcas and the abundance of marine wildlife. The remainder of the day is at leisure to explore the city’s delights. We continue through the resort region of the Gulf Islands to the ocean-side city of Vancouver. Upon arrival in Vancouver, we enjoy an interesting tour of the city, including Stanley Park, English Bay, Gastown, Chinatown, and much more. The remainder of the day is free for independent exploration or simple relaxation. This evening features our farewell dinner party. Continental breakfast and dinner included. this afternoon for one of the most famously beautiful passages in the world. Breakfast and dinner included. Overnight on board the Nieuw Amsterdam. Enjoy the fantastic scenery on the first full day of cruising, travelling through the Inside Passage. Just beyond the deck rails, the gems of Alaska are laid open in a spellbinding vista of rain forests, glaciers, fjords and white-capped peaks. Along the way it is common to view whales and sea lions at play along the coastlines as well as a near countless assortment of marine bird life. Overnight on board the Nieuw Amsterdam. Sawyer Glaciers. Arriving in the port of Juneau, take some time to explore this unique state capital and its frontier culture and spirit. Overnight on board the Nieuw Amsterdam. Cruising to the Gold Rush stopover town of Skagway, travel in the footsteps of the prospectors that either continued on to the gold fields or remained to create the historic town that still thrives today. Perhaps take some time to ride the antique White Pass & Yukon narrow-gauge railway, step into the Red Onion Saloon or peruse the restored buildings and wooden boardwalks of the Klondike Gold Rush National Historical Park. Overnight on board the Nieuw Amsterdam. An exciting day cruising ahead, exploring the famous waters of Glacier Bay – home to Glacier Bay National Park. A UNESCO World Heritage Site, the park boasts a unique ecosystem of plants and animals living in concert with an ever-changing glacial landscape. When a monumental chunk of ice splits off a glacier and thunders into the sea, the impact shoots water dozens of metres into the air. Glacier Bay has more active ‘calving’ (splitting off) tidewater glaciers than anyplace else in the world. Overnight on board the Nieuw Amsterdam. Cruise into the port of Ketchikan today, set along the shores of the Tongass Narrows, unique for its many shops and houses built suspended above the water. Known as the Salmon Capital of the World, this lively town also is home to Creek Street, the Tongass Historical Museum, Totem Bight State Park and the Saxman Village. The town is surrounded by natural wonders, inviting all visitors to discover their wild side amidst the wilds of the Alaskan landscape. Overnight on board the Nieuw Amsterdam. 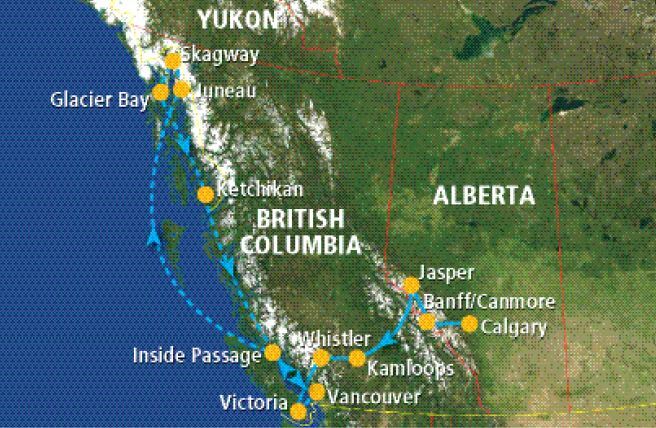 Today the ship slowly retraces its voyage along the Alaskan and British Columbia coastlines. Watch how the landscape slowly and subtly changes as you descend into the more southern and warmer climate of the Pacific Northwest temperate area. Overnight on board the Nieuw Amsterdam. Early this morning you arrive in the port of Vancouver and disembark the Nieuw Amsterdam. You transfer individually to Vancouver’s International Airport in time to check in for your return flight, alternatively we can arrange post tour accommodation if you would like to stay on for a little longer. Scheduled airline reliability is key to ensuring you arrive in good time for the start of your tour. Saver fares available with charter airlines on request but pre-tour night in Calgary strongly advised. Optional activities may be booked on site with your tour director. Prices will be competitive with locally available sightseeing tours. You will pay the tour director directly. Credit cards (Visa, MasterCard) are accepted. There are additional excursions available while on the Alaskan cruise portion of the tour. Holland America offers daily port-of-call excursions, bookable and payable on-site. Cruise directors will have a list of available excursions and pricing. The balcony and outside cabins have either a window or sliding glass door. The inside cabin does not have a window. Two lower beds convertible to queen, approximately 16.25 sq metres, complimentary 24-hour room service, Dual voltage 110/220 AC, Four pillows in every stateroom, complimentary use of bathrobes, 100% Egyptian cotton towels, bathroom accessories & hair dryer, complimentary beach towel service, plentiful storage space in your bathroom and wardrobe, laundry service*, 23” LCD-HD Interactive television system to view & select shore excursions, order room service & watch movies*, luggage delivery, individual safe, direct-dial telephone, thermostat-controlled air-conditioning, mini-bar*. Balcony (3.9 sq metres). Please note: Inclusion of a balcony can vary depending on ship and location of cabin.